Forbes put Kungur on its list of the 10 most impressive caves in the world. The natural attraction welcomes around 90,000 visitors per year. 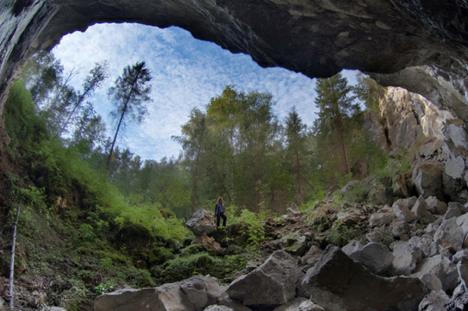 The grottoes’ beauty and the convenient location have made this cave the most visited attraction in the Urals. It extends over 5.6 kilometers, of which 1.5 kilometers are equipped to receive tourists. People have been touring the Kungur Ice Cave for more than a century. According to recollections by the trailblazers, in order to reach the cave’s grottoes, people had to spend several hours cutting a path through ice that was frozen over. The pioneers explored the underground vaults by torchlight, tying rope around themselves, making their way through stone gorges and scaring bats, the cave’s native inhabitants. Tourists can reach this Ural wonder on their own, taking the train to the Kungur city station or driving on the Perm-Ekaterinburg highway. From Perm, tourists are driven on designated buses straight to the entrance marked “Ice Mountain.” The trip from Perm to Kungur takes one and a half hours. In the summer, visitors will need to take warm clothing because the temperature in the cave is significantly lower than it is above ground. However, the ideal time to visit is February or March because that is when the seasonal stalactites and stalagmites reach their most impressive sizes and shapes, beautifying the cave’s vaults. Nowadays, tourists enter the cave through an artistically laid-out tunnel, and the more the tunnel descends, the colder it gets. Summertime visitors feel a striking contrast: outside it is hot, the gypsum rocks are white in the sun and the stuffy air smells of prairie grass. But all one needs to do is open the massive door to the underground cave and the Ural winter begins to blow. One of the most beautiful places in the cave is right near the entrance: the Diamond and Polar grottoes. Layers of ancient ice in these chambers overflow under spotlights, bringing to mind a frozen waterfall, while vaults cover large crystals. They form fanciful clusters that have expanded so much that they occasionally collapse under their own weight. Here the famous ice columns, stalagmites, rise from the ground. In all, Kungur Cave contains 48 grottoes. Each one has its own story and unique name. For example, there are the Coral and Sea Bottom chambers, which are ornamented with stone lace that water wore away for 12,000 years. In the Meteorite chamber, a viewer has the illusion that huge celestial bodies are lying under the earth. The cave under Ice Mountain is considered to be one of the most studied caves in Russia. Here there are paths, the chambers’ vaults have been fortified, electricity has been installed and spotlights set up. Despite this, the caves still offer surprises to researchers. For instance, last year scientists from the Mountain Institute of the Russian Academy of Sciences unearthed a new mineral that had never before been seen in Russia. In addition, while researching the Kungur Cave reserve area, a group of speleologists discovered a new underground gallery filled with water. The underground lakes, which number exactly 70, amaze visitors with their beauty. They also have their own stories. For example, in the Titanic grotto one can see a large underground lake that acts like a mirror and reflects the cave’s vaults, which in the reflection look like a sunken city. In order to reach the Central grotto, visitors must climb the Woman’s Tears slippery gypsum steps. These steps got this name because in 1914 the German princess Victoria von Battenberg visited the cave with her daughter Louise. The girl climbed on them for a while and started to cry. The incident gave rise to the legend that a young woman who hits her knee on these steps will be able to find her prince. Directly across from Ice Mountain is the Stalagmite tourist complex, in which visitors may relax from their trip, book a city tour or float in the Sylva River. According to one legend, the Cossack chieftain Yermak spent the winter on Ice Mountain with his army, hiding his treasure in the cave. The place of the troops’ alleged encampment is called by that name—Yermak’s fort. However, there are no reliable confirmations of this information. At the same time, the cave does have true stories. For instance, in 1974, an avalanche that covered a grotto exit trapped a group of students inside and forced them to ring in the New Year there. Grasping that they would not be able to get out quickly, they fashioned decorations from improvised materials and decorated a stalagmite column instead of a tree. The students’ festive table held dry rations: wafers and sprats. So as not to freeze, the students spent the night dancing, singing and reciting poetry. They could not get out until morning. The Christmas tree that the employees of the Kungur Ice Cave lower underground can stand in the cave for more than a year and a half without shedding. Scientists note that the 80-meter layer of rock, like the most effective filter, cleans the air that enters the grottoes through fissures. As a result, the atmosphere in the cave has healthful properties: it has exceptional composition and ideal purity, and it contains no microbes or dust. Here an organism that has accumulated allergens can relax. In addition, the cave’s air contains many negatively charged air ions and carbon dioxide that create an effect of rejuvenation. Even regular tourists who follow the route for an hour and a half feel a positive effect. These air properties of the karst rock are already being used in caves in the Czech Republic, Slovakia and Spain to treat bronchial asthma and other respiratory conditions.